Beautifully constructed baby boy christening shoe. Made of 100% cotton sateen. 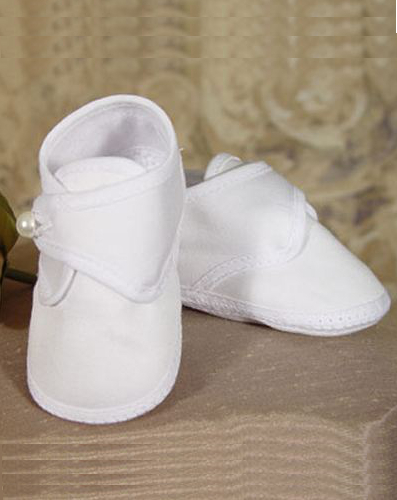 The perfect touch with cotton or poly cotton christening sets. A cross-over side tab is buttoned with a pearl shank button. US made. Better brand. Usually ships in 2 - 3 business days from the DapperLads store. The bottom of the booties measure as follows: 0 - 3 3/4", 1 - 3 15/16". Booties may only be returned if they are unopened and not tried on.